Who Will Win the 2019 Stanley Cup? Known as ‘the Great One’, Canadian Wayne Gretzky is regarded by many as the greatest hockey player of all time. During a career which lasted from 1979 until 1999, Gretzky broke numerous hockey records, many of which still stand. Gretzky was born in Brantford, Ontario and quickly became known for his skillful, technical play. He initially played for the Indianapolis Racers in the World Hockey Association, before that folded in 1979, and he joined the Edmonton Oilers in the NHL. 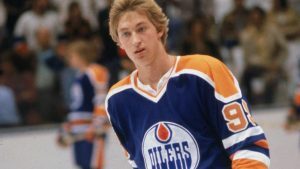 Gretzky played for the Oilers for 10 seasons, during which he began to establish himself as a truly exceptional player. He won four Stanley Cups and also led the scoring in almost every campaign he played, including hitting a record 92 goals in the 1981-82 season. Gretzky claimed a record nine NHL most valuable player (MVP) awards, including eight on the spin. No other player, including the great Gordie Howe, has ever managed more than three in a row. In 1988, Gretzky scored the winning goal in the Stanley Cup for the Oilers, after a season affected by injury. He then moved to the Los Angeles Kings, leading them to the Stanley Cup finals for the first time in 1993, and helping to increase participation in the sport in the Golden State. After leaving the Kings in 1996, Gretzky’s career started to wind down in spells at St Louis Blues and New York Rangers, and alas, the Great One was unable to add a further Stanley Cup to his haul. Gretzky retired from hockey after the 1999 season and still holds an incredible 61 NHL records, including the most goals and the most points in both the regular and post-season. The NHL retired his number 99 jersey across the league, making Gretzky the only player ever to have achieved such a feat.